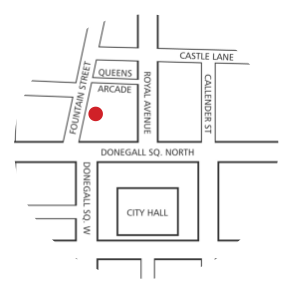 Next week sees Fountain Street in Belfast transformed with art, guerrilla gardening, film, music, tango, BBQ and more! Check out the full event listing here - also look out for the booklets in various venues across the city. Come join us at PLACE for the special launch event on Wed 22nd July from 6pm-8pm, where we'll introduce the week's activities - all welcome; refreshments will be served! If you are interested in volunteering to help us out at the events next week, get in touch in the same way! Published last week, Raising Standards is the first report on the work of MAG (the Ministerial Advisory Group on Architecture and the Built Environment). The weePLACE exhibition cabinet continues to display interpretations of the built environment from all walks of life. Coinciding with PLACE's Garden, Dublin-based Eva Maher presents her 2D and 3D works based on "the arduous experience that is moving house". Launching Wed 22nd July at 6pm. And in August, alongside David Turner in the Main Gallery, Henrietta Williams presents On the Threshold, a collection of photographs exploring the regeneration of the land that lies alongside interfaces in Belfast. After a six-month residency at QUB School of Architecture in 2008, fine artist David Turner has developed an exhibition exclusively for PLACE. The pencil drawings show physical cross-sections of buildings throughout Belfast City Centre which have been deconstructed by attacks during the Troubles. The latest edition in this ever-popular series is now available, with profiles, illustrations, drawings, photography and in-depth analysis of the best new Irish architecture of the past year, as selected by the Architecture Association of Ireland. Until the end of August, when you spend £30 or more you will receive a £5 discount voucher for use in RIBA Bookshops (including PLACE and the RSUA in Belfast). News on our upcoming exhibitions and events, plus PLACE publications and archives. From YouTube, a film about Best Products Co stores designed by SITE in the 1970s - click here to check it out. Stay in touch with us on the blog for up-to-date news and thoughts about the built environment in Northern Ireland and further afield. Comments welcome! Our team of voluntary librarians are moving on to the classification stage of our new library at PLACE. Keep up with them on their blog! Join us on Facebook for news and invites to upcoming events! PLACE will be closed from 15th - 20th July, reopening on Tuesday 21st July. To book for any of the upcoming PLACE's Garden events, simply email us at info@place.uk.net or call (028) 9023 2524 and leave a message.